Quite frankly, I’m not going to dwell on who comes up with these things. Nor am I going to ponder the occasion for downloading this printable. 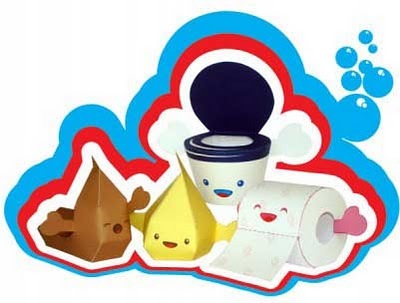 The Toilet Team paper toys by PaperBoxWorld lets you create your very own paper bathroom ‘accessory’ – meet Bowls, Rolly, Wee and Doodoo – I think that’s all I need to say. Let’s just file this one alongside the pee and poo M&Ms and the toilet training plush pals. The Toilet Team are free to download at PaperBoxWorld.